It’s been a long while since I’ve found myself humming a song with an Old Western influence. But ever since I finished Bastion a few weeks ago, and the Calamity came and wiped almost all of humanity away, every so often I’ll start vocalizing a sorrowful tune about building walls and awaiting their fall. As clunky as Bastion can sometimes feel through the (arguably intentional) stiff movements by its playable character, The Kid, its story and delivery make it pretty spectacular—more so by making me nostalgic for Western films, when my knowledge of them is relatively limited. Taking the fight to the wilderness, and through the remnants of Caelondia—with dueling pistols and a Marshal’s badge in The Kid’s possession—Bastion merges two distinct experiences of an Old Western tale in a sci-fi fantasy setting. This blending of genres is reminiscent of series I’ve loved such as Trigun, Cowboy Bebop, and Firefly, to name a few. I’m late but 2011's Bastion joins this list, and has a certain grittiness which I enjoy, with a common Old Western element of a roaming ragtag group growing together to explore the vastness and desolate expanses of a rough, dog-eat-dog existence. That feeling of hopelessness in exploring what’s left among the floating fragments of a destroyed world is one of the things that draws me to the game. 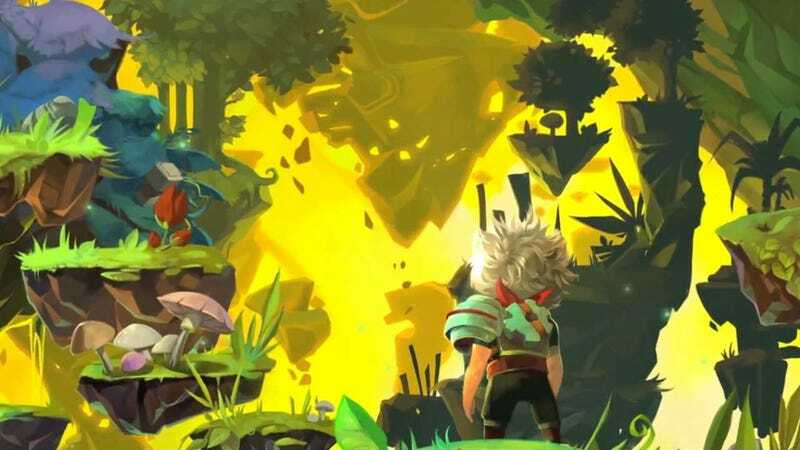 Bastion’s “Wild West” appeal lies in that simple feeling of uncovering story elements through the gravelly tones of its Narrator, set to a dynamic soundtrack. It’s in part going into the wilds as the predominant focus—investigating to discover what remains after an event known as the Calamity claims it, and turns its inhabitants to ash. There’s the loneliness each character has to endure, as part of atonement and enlightenment. And there’s a tale of morality at play as well—reasons for the cause of the Calamity, and reprehensible decisions by Caelondians to subjugate an ethnicity of people called the Ura, in a long history of war between the two groups. By the time we’re in the shoes of The Kid, Bastion shows this aftermath of an obliterated structured society upheld by laws fashioned with Old Western ideals—the Marshals with firepower and a variety of guns and sword, Brushers who hunted in the wild, and Caelondian scientists who developed more powerful weaponry to keep a war in check. There are hints in the objects The Kid finds of this Western lifestyle integrated into a science fiction fantasy, where strange creatures carve out a safe haven of their own after the Calamity hits, run wild and where laser beam projecting enemies attack with brutal force. The wandering after the tragedy takes The Kid to broken landscapes where beauty once resided, with a dangerous wilderness taking almost complete control. This is, in part, where the sci-fi fantasy comes in for Bastion. As The Kid treads upon the suspended bits of land, bricks build with every step he takes. Some paths take him to dead ends, others into danger, and others towards his destination. The game is filled with beautiful scenery of a world that once was—amidst the destruction with the crumbling buildings adding to the beauty too. Colours pop in the designs in architecture from the Hanging Gardens to the ice-laden sheen of the Uran stronghold. Bastion is a gorgeous fantasy with snippets of this civilization and magnificent alien wilderness surrounded by decay. There’s technology built into skyways which ungracefully throw The Kid to various parts of the world. Technological advances in weapons are mixed in with relics of deadly but simple tools such as the machete, or Brusher’s pike. Slow-paced notes get interrupted slightly at the 59 second mark for just a moment, until it returns to that laid back steadiness which makes it feels as though you’re angling for trouble. Mixed with classical notes of a harp and underscored by beats of a modern, experimental sound interwoven with violins, parts to “The Mancer’s Dilemma” then cut away to focus on the beats alone, which then gets interjected by a banjo. The harp reads like pondering, fitting of the track’s name but the din of the other instruments surrounding it make it foreboding. The other aspect which encompasses the sci-fi and Western feel comes with Bastion’s narrative and its telling of it, respectively. It’s increasingly difficult to find a narrative that when taken at face value, offers anything wildly brilliant, or original. Bastion’s is partially sci-fi in design, particularly at the end when a decision is left to the player. It’s heavily implied that choosing one could lead to repeating history, and doomed to being stuck in a loop—time and time again. Bastion has a good story, and while not entirely unique, its delivery is what sets it apart. It’s thanks to Logan Cunningham’s soulful, personable and amazingly talented portrayal as The Narrator, Rucks. He relays a story with a deliberate Old Western style. It is thoughtful, and often filled with regretful pride. A campfire story holding an unfortunate truth of sins of the past, indecisive pondering as to how to fix tragedy, and warnings to the few remaining, himself included. The ability to tell an interesting story—with cues from the game that followed your every move about which The Narrator made off-hand comments on—really gave the game an outsider, richer perspective. It broke the Fourth Wall, and these little moments that were commented on—such as falling off the map or having to retry a challenge—not just told a story but engaged players. His purpose was to tell the story of the Caelodians and the Ura, but it also felt as though players were being told their story in how they directed The Kid’s actions. In other words, The Kid wasn’t just a character in Bastion although he is referred to in the third person, but you, the player is acknowledged, which made the experience even more worthwhile and interactive. The sci-fi world building intrigued me, as I knew it would. But I couldn’t help but hang on to every word in Bastion due to its ties to an Old Western presentation overlaying the entire package. With the announcement of a new game slated for 2017, I’m wondering which genre Supergiant Games will have me yearning for next. In the meanwhile, I’ll keep carrying that tune—the one lamenting progress, and gaining civilization at the cost of humanity. Building walls and watching them fall.